Likewise, we already know Google is teaming with Sony, Logitech and Intel to integrate it’s own streaming content interface into televisions, cable boxes and Blu-ray players. The cable companies, meanwhile, have the warchests they’ve been building up from the virtual monopolies the government continues to allow, so long as the campaign contributions continue. The survivors in the coming armageddon will probably be the companies that offer a broad selection of content at a low price early on, because a marginal lead in subscriber numbers, through network effects, can over time lead to decisive victories. But you’re just a lowly independent filmmaker. You may only have one movie to sell. What can you do to get through this carnage? Play one side against the other, on whatever scale you can leverage! You control a precious resource: content. The more you control, the better your position. As I’ve advocated, indie filmmakers need to start bundling their movies together into libraries. As a representative of a block of films (or just one film that is well-known) you have the ability to milk all sides for the streaming and other digital rights, and negotiate non-exclusive, short window contracts. Netflix reportedly paid $32M to Relativity Media for a year’s worth of non-exclusive streaming rights. What did Relativity have to offer? Charlie St. Cloud, Macgruber and, to be fair, some movies that were big hits, like 300. This is just for Netflix to offer these titles through Netflix. Non-exclusively, so Relativity is still free to rake in more cash from other streaming platforms. This deal certainly points a way forward for large independent producers. But still, it’s going to be a little while until Netflix has worked its way down the long tail to smaller independent producers. Now is the time to get positioned and, like a musician who owns her own masters, get rich by not selling out! 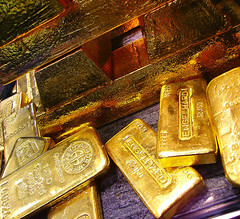 NBP Gold by Flickr user covilha used under Creative Commons Attribution 2.0. UPDATE 10/24/10: Mark Cuban thinks Netflix may have already won the streaming wars. UPDATE 10/17/11: Check out my list of streaming movie outlets for indie filmmakers. Great post. It’s going to be interesting to see how all of this plays out and how it’s going to impact theaters and everyone else involved.